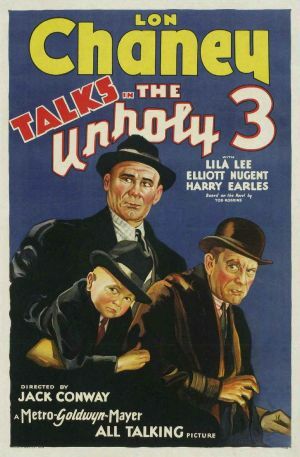 Tag line: "Lon Chaney Talks"
1930’s The Unholy Three is notable for being the only sound film that Lon Chaney Sr. ever made, and from the looks of it, he would have probably been just as big a star in talkies as he was in the silent era. When their circus is shut down by the police, voice specialist Echo (Chaney), strongman Hercules (Ivan Linow), a midget named Tweedledee (Harry Earles, who, two years later, would star in Tod Browning’s Freaks), and Echo’s sometimes girlfriend, Rosie (Lila Lee), embark on a life of crime. To keep the cops off their trail, Echo disguises himself as Mrs. O’Grady, a kindly old grandmother and the proprietor of a neighborhood pet store, with Hercules posing as the old girl’s son-in-law and Tweedledee pretending to be Mrs. O’Grady’s infant grandchild. Robbing the homes of the pet shop’s wealthiest clientele, the trio rakes in the dough for a while. That changes, however, when straight-laced Hector McDonald (Elliott Nugent) is brought in to help run the store. Not realizing that his employer is both a fraud and a criminal, Hector falls in love with Rosie, who, after stringing him along, begins to develop feelings for Hector as well, infuriating the extremely jealous Echo. To further complicate matters, Hercules and Tweedledee pull off a job by themselves, during which they gun down a homeowner in cold blood. Not to worry, though, because Echo has a plan that, if all goes well, will take care of both these problems simultaneously. A taut, occasionally suspenseful motion picture, The Unholy Three (which was a remake of a 1925 silent that also starred Chaney and Earles) successfully blends drama, comedy, and thrills into a satisfying whole; in one of the movie’s best sequences, a police inspector (Clarence Burton) visits the pet store to investigate the robbery / murder committed by Hercules and Tweedledee. Making us laugh early on (Tweedledee, dressed like a baby, puffs on a cigar, thus almost giving their secret away), this scene also gets plenty tense before its over (Tweedledee hides a necklace they stole in a toy elephant, which the inspector innocently picks up while asking his questions). Rising above it all, though, is Lon Chaney Sr., who, along with providing some comic relief as Mrs. O’Grady, shows off his ventriloquist skills (in the opening sequence, set at the circus, he does an entire routine with a dummy) and even impersonates a parrot! This, combined with his often hard-edged portrayal of Echo (who resorts to threats to keep Hercules and Tweedledee in line), helps carry what was already a fine motion picture to a whole new level. It’s a damn shame that Chaney didn’t live to make more sound films (he died of throat cancer one month after this movie premiered). Based on what he showed us in The Unholy Three, the “Man of a Thousand Faces” was on his way to becoming the Man of a Thousand Voices as well.